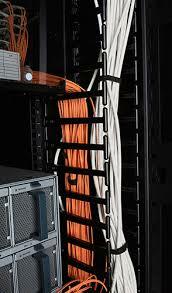 NetShelter Vertical Cable Management organizes and protects cables data centers and telecom applications. More servers means more outlets and more data cables that need to be managed. Secure and protect both fiber and copper cabling at every U space with the AR771. Our low profile cable manager, like the AR7580A, secures all cabling outside the 19″ rack-mounting space and maximizes access for user-replaceable components.